Glucagon - An islet cell hormone that has multiple actions to raise plasma glucose. Insulin - An islet cell-produced, anabolic hormone that controls glucose uptake, fat synthesis, and synthesis of proteins. Islet of Langerhans - Clusters of cells in the pancreas that produce the endocrine secretions of the gland. They constitute about 1% of the pancreatic mass. 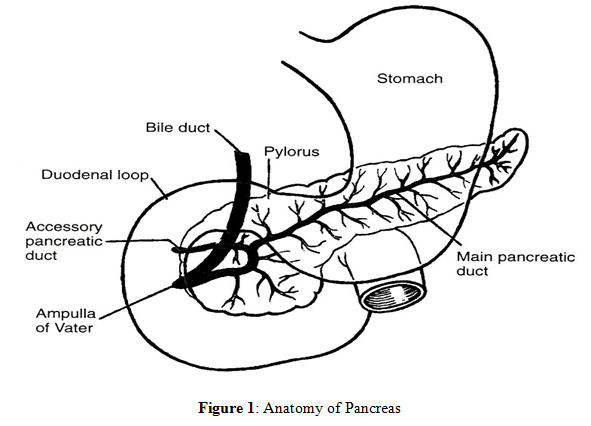 Pancreatic duct - A conduit that passes through the pancreas, collects the pancreatic exocrine secretions of enzymes, water, and electrolytes, and carries them to the ampulla of Vater. Acute pancreatitis occurs in 1 in 500 acute admissions and severe attacks have a 20-50% mortality rate. Most cases occur in older patients (greater than 50 years old) and are frequently associated alcoholism, hyperlipidemia and biliary disease. However, approximately 2% of acute pancreatitis cases are drug-induced. The laboratory plays an essential role in the rapid diagnosis of acute pancreatitis allowing clinicians to make appropriate therapeutic decisions. A small amount of pancreatic amylase normally escapes into the circulating blood and, having a molecular weight of only about 45,000, is readily excreted by the kidney into the urine. Thus, increased entry into the blood or decreased renal excretion generally lead to increased blood levels. A few hours after the onset of acute pancreatitis, serum amylase levels become elevated, but return to normal levels within two to three days. Elevations >5× the upper reference limit (URL) are considered pathognomonic for pancreatitis. Amylase also is found in other tissues, especially in the salivary glands and Fallopian tubes (may cause elevated serum amylase in ectopic pregnancy), but amylase activity to a lesser extent is also present in many other tissues (liver, muscle, adipose tissue, kidney, brain, lung, intestine, spleen, serous ovarian tumors, some lung tumors and most body fluids and excretions). However, under normal conditions 50% of the circulating blood amylase is derived from the pancreas. The clinical specificity of this test is low. In contrast to some other serum enzymes, serum amylase is relatively stable; even at room temperature it is stable for several days. The isoenzymes of amylase are S (salivary) and P (pancreatic). They can easily be measured immunochemically; use of the P-isoenzyme increases specificity for acute pancreatitis. This is a benign condition in which normal amylase forms macromolecular complexes with immunoglobulins (IgG, IgM) or it exists as a large polymeric aggregate, resulting in a variety of “macroamylases,” which, because of their large molecular size, are not excreted by the kidney. This results in elevated amylase levels in the serum. This condition has been observed following treatment with hog pancreatic extracts and occasionally in malabsorption syndromes, but otherwise is usually innocuous. Its clinical significance lies in the fact that the hyperamylasemia or macroamylasemia may lead to misinterpretations in the differential diagnosis of abdominal distress. Macroamylasemia accounts for 2.5% of hyperamylasemic conditions. One per cent of healthy subjects have macroamylasemia. It requires no treatment and, in fact, may be transient. In this condition, the amylase/creatinine clearance ratio described below is usually <1% (normal 1-5%), and the urine amylase is usually low. Serum lipase activity is due to a number of enzymes from various sources, predominantly the pancreas. Lipases are reabsorbed by the kidney, and lipase activity is undetectable in the urine. Renal excretion of amylase depends on the serum levels, and in hyperamylasemia increased amounts of amylase appear in the urine. Since this excretion is relatively rapid following moderate bouts of pancreatitis, serum levels may be borderline or normal while urinary amylase may be elevated. Macroamylasemia, where the urinary values are normal or low. Patients who present with the clinical picture of pancreatitis while their serum amylase is normal. Note: This test is not frequently used since ultrasound and CT scan frequently can provide a rapid diagnosis of cholecystitis vs. pancreatitis. The renal clearance of amylase has been shown to range from 1 to 3 mL/min and is constant over a wide range of urine flow. Increased blood levels of amylase are followed by increased excretion into the urine. It has been shown that this increase in excretion in pancreatitis is further augmented by an increased renal clearance rate of amylase (see urinary amylase). The test can be very useful in the confirmation of macroamylasemia. In order to correct for the interindividual differences in renal function, it has been found advantageous to express amylase clearance as a percentage of creatinine clearance: the so-called amylase/creatinine clearance ratio. Notice that the factors of urinary volume and time cancel out of the equation which eliminates the need for cumbersome, timed urinary and blood collections. The test thus can be carried out simply on simultaneously collected random samples of blood and urine. In pancreatitis, values range from 5% to greater than 20%. In macroamylasemia, values are usually less than 1%. Increased clearance is not a specific response to pancreatitis, but instead may be due to competition for reabsorption of low-molecular-weight proteins by the renal tubules. Increases in amylase clearance and the ratio of amylase to creatinine clearance are observed in a number of non-pancreatic disorders, such as burns, myeloma, duodenal perforations, and following extraperitoneal surgical procedures. Comparisons of serum and urine tests have shown that serum enzyme tests had greater diagnostic utility than urine tests. Acute pancreatitis often is accompanied by accumulation of effusion fluids in the peritoneal and even pleural spaces. If the differential diagnosis is in doubt, particularly with normal or near normal serum and urinary amylase and lipase values, a high amylase value found in an effusion fluid supports a diagnosis of pancreatitis. Reference ranges are the same as in serum. The hypocalcemia of pancreatitis is a complex phenomenon involving saponification as well as glucagon and gastrin release from the pancreas which in turn, stimulates calcitonin release from the thyroid, leading to phosphaturia and calciuria. Since 50% of calcium is protein bound, hypoalbuminemia will further depress calcium levels. Calcium remains low despite calcium infusions. There appears to be a correlation between the degree of hypocalcemia and the clinical severity of the pancreatitis with calcium levels below 7 mg/dL constituting a very ominous sign as they are associated with a high percentage of fatal outcomes. It is of interest to mention here that in the acute “pancreatitis of hyperparathyroidism” the hypocalcemia does not occur, indicating the importance of the roles of hormones in controlling the calcium blood levels in pancreatitis. Triglycerides may be markedly elevated in acute pancreatitis often causing turbidity of the serum. This is also considered an ominous sign. Note that hyperlipidemia can be a cause of pancreatitis. Acute pancreatitis often leads to glucose intolerance, with transient hyperglycemia and abnormal glucose tolerance curves (“burnt out” pancreas). Hyperbilirubinemia is observed, even in those patients that have no evidence of biliary obstruction. The mechanism for this elevation is not certain but may be due to hemorrhage from the pancreas. This test can be used to distinguish edematous from hemorrhagic pancreatitis. It is thought that the extravasated blood in the pancreatic area is subjected to the digestive action of the pancreatic enzymes, liberating hemin which combines with albumin to form methemalbumin. However, methemalbuminemia is seen in many other conditions, including some with hyperamylasemia, such as ruptured ectopic pregnancy, peritoneal hemorrhage, mesenteric thrombosis, etc. In chronic pancreatitis the biochemical changes are quite variable depending on the severity and stage of the disease. For instance, serum amylase may be elevated, normal or even decreased. With long-standing pancreatitis, sufficient pancreatic destruction may have occurred so that amylase cannot be elaborated. Duodenal intubations often are necessary to establish the diagnosis. A more detailed discussion here is beyond the purview of this chapter. A 33-year-old woman was admitted to the hospital with severe and constant upper abdominal pain (pain level score 8/10) associated with nausea. She had been diagnosed with primary hypertension and was treated with felodipine without adverse effects. Because of inadequate control of her blood pressure 10 days before admission, felodipine was discontinued and irbesartan 300 mg and hydrochlorothiazide 12.5 mg once daily was started. She denied recent alcohol intake, alcoholism, or recent viral infection. There was no personal or family history of pancreatitis, cholelithiasis, or hyperlipidemia. Examination revealed an obese (weight 107 kg, height 169 cm) woman with low-grade fever (37.4ºC), relative hypotension (116/55 mmHg), and moderate upper abdominal tenderness with no bowel sounds. Laboratory data showed increased serum concentrations of lipase and amylase; all other hematologic and biochemical variables were normal (Table 1). How do you interpret these lab values? Are patient’s symptoms and clinical presentation consistent with the laboratory values? What is the appropriate course of action for this patient? Is this a common ADR for this drug combination? A 35-year-old man is admitted to the hospital with abdominal pain of sudden onset. He also has swollen, painful salivary glands. His serum total amylase is 600 U/L. What clinical conditions may explain the hyperamylasemia? What laboratory tests should be performed to test each hypothesis? A 43-year-old man three years post-pneumonectomy for pulmonary adenocarcinoma is distressed to learn that his serum amylase is 450 U/L. What clinical conditions may explain the patient’s hyperamylasemia? What laboratory tests should be performed to evaluate each condition? lipase, 1400 U/L; leukocyte count, 18 x 103/ uL. Amylase returned to normal after 3 days and lipase after 7 days of admission to the hospital. What diseases should be considered in the differential diagnosis? Since the patient’s pain appears to be intra-abdominal that is not colicky, which diseases can be excluded? Can an MI be excluded on the basis of laboratory data? Do serum amylase and lipase values support pancreatitis? Would a CT scan be helpful in confirming the diagnosis? i have a lower level of calcium what does that mean? i have a severe upper abdominal pain, when it's start i just can't tolerate, in my blood report amylase & lipase counting are also in normal range but wbc counting increased. no one can diagnose my problem.. what should i do? i can't take this anymore. It repeats often and that time i can't take a single drop of water for the pain. please help me..